My study proposal includes a number of works which progressively illustrate the impact of digital on life drawing. My focus in this blog is my proposed over-sized painting in the minimalist illustration style of Michel Canetti. This is to be produced using a traditional charcoal drawing from the life model displayed large on the canvas using a digital art projector. The purpose of the projected image is to maintain perspective when working close on a large canvas, and to mark out the areas where you decide to paint. Michel Canetti’s work has been displayed at the Saatchi gallery in Chelsea, London. 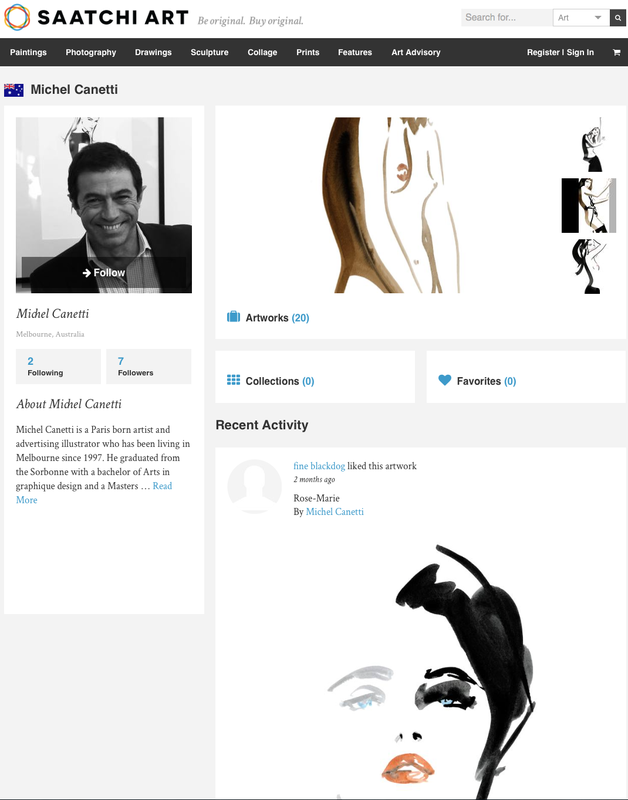 He is famous for his fashion illustrations while working in Paris where he trained. These were prolifically published in Vogue and many other quality fashion magazines, and the originals are now very expensive collector’s items. He lives in Melbourne where he has a studio and is booked many months ahead on commissions for his huge minimalist portrait paintings mainly of his female clients. He now only exhibits his work there and in Canberra. I have been in direct correspondence with him about his approach which I am attempting to follow. I quote “Dear Terry, Yes you could use a projector to draw your limits of paint. It’s a good technique…..Kind Regards, Michel Canetti’ (24/01/15 an extract from LinkedIn correspondence between us). I have now arranged for a model to sit for me over two afternoons in early November at the Cheyne Drawing Studio in Chelsea. Her name is Vanessa and as well as being a professional life model she is also a classic dancer. I aim to draw her in Charcoal on A2, which I will project on to a large canvas in another studio (possibly at UAL) where I will paint her in the minimalist illustration style I have referred to. This will be in a very limited set of colours, mostly black, white, and grey with a small splash of colour such as on her lips or eyes. I will also ask her to say something about herself and voice record her speaking about her feelings before, during and after the sitting. Later I hope to record her comment on the finished work. I intend to use some special paint, which will be linked unseen behind the canvas to an Arduino micro processor. When the viewer touches specific pieces of the painting they will be able to hear the model speak. I am indebted to Grace Attlee who has just joined MA Illustration and works at BareConductive in London, whom I first met at our Welcome event for MA Visual Arts Camberwell. BareConductive supply conductive paint and the means to link it to microprocessors such as the Arduino. Last weekend they had an exhibition of their BareConductive Playground at the London College of Fashion, Mare Street Campus. By chance conversation Grace introduced me to the idea of possibly using her company’s products in my work. Thus I aim to give the normally silent life model a voice in my work. This entry was posted in Uncategorized on September 29, 2015 by terencemquinn91. This week several students watched the 2015 Lumen Prize Ceremony in the comfort of their own home while at the same time maintaining a group dialog with Jonathan’s concurrent Skype session. This worked amazingly well and it was really interesting to get everyone’s comments and participate in a live discussion as the ceremony took place. Alasdair actually managed to attend the event itself. A small group of mainly first year MA Fine Art Digital students also spent the day at the V&A (many thanks to Alejandro for organising it – we now have a WhatsApp group for these trips) for The London Design Festival. There are far too many fantastic exhibits to highlight so I will just include my own personal favourites. At the Lumen event there was a heavy leaning towards data driven projects particularly during the presentations before the awards. I am sure that those presented had great thought behind them but artistically I felt that most had low impact visually. One prize winning installation stood out for me – ‘Forte’ by the lab 212 collective in France. They used a church, ceiling to floor strings along the aisle between the pews, and a digital self playing grand piano near the alter to produce an interactive work. Pluck different strings and the piano plays random snippets of compositions by one of the group. Take a look. Compared with the Lumen prize data driven projects one at the V&A completely blew me away. This was a case of serendipity. I was looking at the V&A programme and saw the name Alex May, who I have mentioned before in a previous blog and who is conducting a Skype seminar on ‘Painting with Light’ (projection mapping) that I am participating in this coming Saturday. I contacted him and found that he was exhibiting and he was there with a colleague Anna with an installation called ‘Sequence’. So I went with the group to meet them and see their work. It was AMAZING! The screen gives only a 2D representation of the 3D view through the VR headset. I quote verbatim from the description of their work. I cannot say that I understand the medical science behind it but I get the gist. ”Sequence’ is a bio-digital installation which investigates the emerging technology of whole genome sequencing of bacteria, which made it possible to study the entire genetic blueprint of an organism …. and how infections spread.’ Given the fact that both Alex and Anna are Artists and not scientists even with the help of Oxford University and others, they had to get to the point where they understood and could implement the whole process…then present it artistically. Anna ‘learn’t how to sequence an entire bacterial genome… including the sequencing of around 2.8 million base pairs of DNA of the Staphylococcus aureus bacteria….’ which lives in her (and our) nose. This data was then assembled and presented using software’ (written by Alex May in C++)’. The funded project took around 18 months to complete. 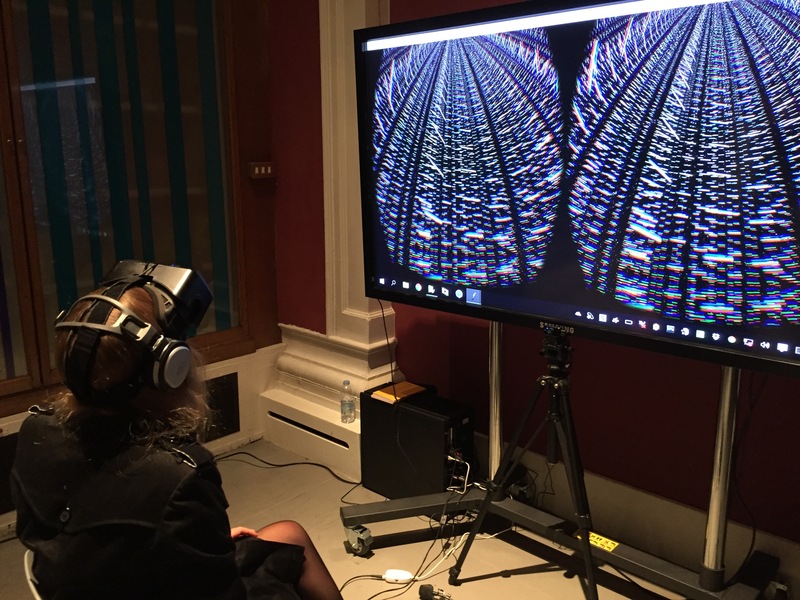 Sitting with the Oculus headset and headphones on you were totally emerged in the middle of the DNA sequence. If you looked up the 2.8 million base pairs projected miles up into space. If you looked down it was like looking at them down a deep mine. You could explore the genome sequence left and right through 360 degrees. The headphone provided explanation but the effect was far beyond my basic description. Just out of this World. Next I was also able to live broadcast a message from the V&A to 6 installations in Mexico City and a dedicated local radio station there. My final ‘pick of the week’ was the installation ‘Curiosity Cloud’ by Micher’Traxler, a work sponsored by Perrier-Jouet, ‘whose label motive is connected to the Art Nouveaux movement, and the traditional use of insect and butterfly motifs throughout this period’ (quoted verbatim from the V&A guide to the exhibition). It was a sensual and interactive installation with its viewers. If there was nobody in the room it would be in darkness. As you enter, hanging sensors throughout the installation measure the level of heat and the position of visitors walking through the centre of the work. This lights up lamps in the vicinity, and controls the light level and speed of insects and butterflies flying within the hundreds of over-sized light bulbs hanging from the ceiling. Take a look and listen as the insects hit the inside of the glass as they fly. And finally to the artist’s dilemma. I attended lectures ostensibly on ‘copyright’ but these were far less dry than I expected. From a theme ‘How does an artist eat’, the speakers contrasted and illustrated the wide use of other artists’ work in their own compositions (or vice versa). Dr JR Carpenter presented a slide quoting Jonathan Letham ‘All art exists in a continuum of borrowing’. Eva Weinmayr presented her ‘Piracy Project’ where she illustrated many works which were almost blatant copies of some other artist’s work. One was a book printed word for word with the same cover as the original famous author with a 50,000 print run which now sold for 20,000 US dollars each as collectors items – many times the original author’s royalties. Smita Kheria’s doctoral research project collected the views of artists, agents and other representatives of the industry to understand their views and requirements on the issue of ownership, copyright and payment. Some artists were happy to ‘open source’ their work. Others did not want payment for the incorporation of their work in that of others, but insisted on acknowledgement. Another group wanted to control distribution tightly, protect their copyright and get paid for its use. Most believed that they had little or no control of the distribution of their work, how they protected their copyright, and even how they got paid for all of its use. A view expressed earlier by Alex May who wondered how he might get paid in future for 18 month’s collaborative work. I opened the panel question and answer session with a suggestion that there might be lessons to learn from the software industry and did anyone have any views on that. For example, some software authors were happy to offer their work as ‘open source’. While others tightly controlled distribution and payment through watermarks, not being able to save or copy, serial numbers, etc. JR (as she was referred to by the rest of the panel) said that anyone who was capable of copying her protected work on her website was welcome to it. She even taught student’s how to do it! There were no constructive arguments to the contrary either from the panel or the audience. A huge business opportunity for someone I think. The other dilemma came out in my earlier conversation with Alex May. Most digital installations rely on other commercially available or open sourced software and hardware. It changes. How does your digital work or installation keep current? Otherwise it probably does not work any more. His view was that we must be losing large swathes of works from the past that are now sadly redundant. The lights go out on your precious and hard work. I have no answer to this. Do you? This entry was posted in Uncategorized on September 27, 2015 by terencemquinn91. I met with Matt Edwards today, one of the senior technicians in the Digital Media Department in the old building for post grad students at Camberwell School of Arts. Following Jonathan’s comment that I had 5 MA’s in my proposal (see my earlier blog) I needed to check out what is possible in a single MA (haha). First I was delighted to find that Matt is a graduate of the same MA course that I am on. He is also now furthering his studies in order to teach. So I value his opinion as an artist and one who knows from experience what the course demands as well as someone who can provide technical support and advice. He is also very approachable, knowledgeable and enthusiastic. When I first described my study proposal to Matt he was inclined to agree with Jonathan, but by the end of our discussion HE THOUGHT THAT I COULD DO IT ALL! That is great news but we will see. I think that I will set out a more limited set of projects in my proposal and see how I progress. If I am well ahead in year 1 then I will press on with the remainder of my projects as outlined in my video. I explained my approach to simplify the tasks ahead and make them much more manageable: If anything will take me more than a day or two (preferably an hour or two) to learn the basics (not to become proficient) then I will automatically reject it as impractical for my proposal. I explained that was how I looked for and found AUTODESK 123D MAKE when Cinema4D (C4D) can do exactly the same thing. C4D is very comprehensive and generalised so that it can be adapted by many different users for their own specialisation and desired outcomes. I would therefore have to learn more complicated tasks than I care to and the C4D method for making an input to a laser cutter is also very long winded and repetitive. So I looked for and found a short cut namely AUTODESK 123D MAKE which took me 30 minutes to learn and I was able to demonstrate to Matt. I was pleased to discover that at Wilson Road we do have the Laser Cutter I need to make my sculpture. Matt did say that this is very popular device so to get in quick. He said that most of the foundation students there use it for making far simpler objects than I had in mind and the technicians there might find my project quite interesting. Advice that I will definitely take by first meeting the technician responsible and explaining my project. Another task for next week. Matt was hugely interested in some of the technology I demonstrated and wants me to show it to his head of department, which I agreed to do. 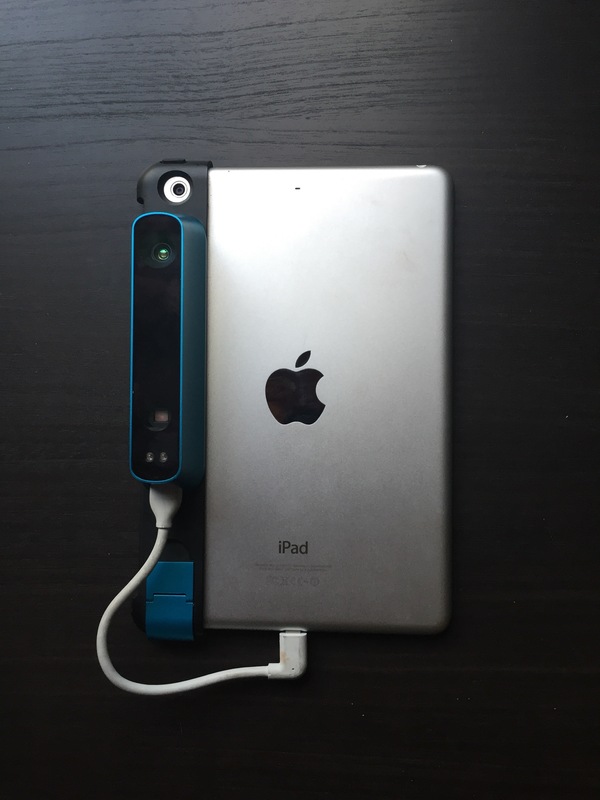 First of all he wants me to show the Occipital Structure Sensor attached to my mini iPad, and how I use it and Itseez3D cloud services to produce a textured 3D model of a person or object. This model is of very high quality and can be made in the classroom in less than 10 minutes. Matt would also like me to show how this 3D model can be exported to other 3D software such as C4D or 123D MAKE in less than 15 minutes.This is another example of finding shortcuts which in this case means I do not have to learn or become proficient in C4D 3D modeling or sculpting. I explained that my main time consuming tasks would be physically assembling the sculpture and in particular learning to paint 3D models in 3D using C4D’s Bodypaint 3D and the Intuos graphics tablet. I need to produce non photo-realistic 3D life drawings in charcoal effect (to limit the use of colour – as more learning and practice is otherwise needed!) to the same standard as my traditional 2D life drawings (see below for an example). But this is how it should be – focusing on producing Art not on the technology. In my 3D painting the above drawing would be capable of being progressively rotated so that you would see the same posed drawing from all sides. You cannot do this in 2D as you would have to make another 2D painting from scratch for each view you wanted to look at. Whilst there are examples of other artists’ work in this area I could find none that worked from life to produce an artistic rather than a photographic or photo-realistic result. That was after long days searching on the internet. So I think that I am breaking new ground here. If anybody can show me a 3D charcoal drawing from life that can be rotated by the viewer please let me know. I was delighted to find that the Digital Media department not only have and know about the Intuos tablet but they also have a Wacom Cintiq tablet (which allows you to draw on the tablet itself rather than the Intuos which effectively uses a pressure sensitive pen as a mouse for the computer that it is attached to). So they can help me set these digital tablets up and become familiar with their use. Very useful as at present, even though I have a large Intuos Pro, I have not used either! The MA Illustration students know all about this so perhaps (PLEASE) they might offer to help me too. I have taken the same approach for producing a drawn rigged and animated 3D model. Except this time the model is taken from those sold commercially and offered in a format acceptable to C4D, usually from DAZ3D or Turbosquid where the model can be posed using software called POSER 2014. This software is comparatively very easy to use (I have experimented and produced results using DAZ3D in less than 30 minutes – see my last blog). With rigging and animation thorough checking is required before you buy them ready made as outcomes can range from it works out of the box to minor tweaking or major effort and skill to make it work in another software package from which the acquired model originated. However, you don’t have to do the checking. Turbosquid for example will do this for you for free. Then avoid anything that needs a lot of work or skill. Try to get something that works out of the box in your chosen 3D modeling package (in my case C4D). So again you can concentrate on painting the UN-animated view of the 3D model as before. Then run the ready made animation this time with your painted model and export it to iMovie (as I did in the crude example in my video blog). So again a shortcut rather than a massive learning curve. 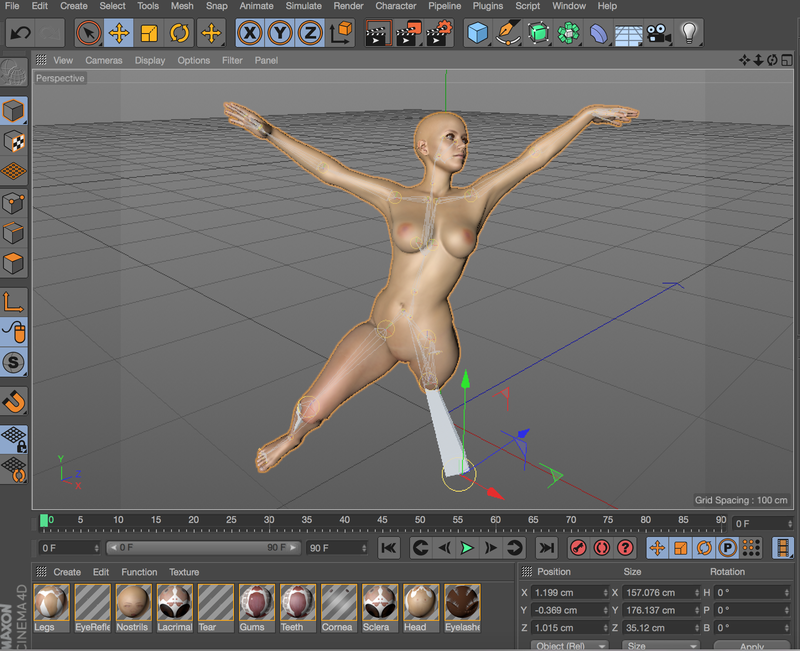 More on this in a later blog when I will show my experience finding a suitable animated model on which to base my work. As Matt pointed out to me this is a valid approach as in the commercial world and due to the complexity there are specialists in C4D as with any other 3D modelling software package. For example, in modeling and sculpting only, in lighting only, or rigging only etc etc. So my chosen and very limited specialisation is …. wait for it …..C4D life drawing in 3D employing only a non-photorealistic charcoal effect and no background or a 2D one from a photo. This is as much as I can cope with if I am to be realistic about including this project in my study proposal. We also talked about Leap Motion where the viewer can in my case rotate the drawn 3D model at a distance with hand gestures. I am glad to say Matt has taken the Leap Motion out of the box (I haven’t), deployed it and says is easy to use. So hooray, more help available here too. Thank you Matt. We are meeting again next week. This entry was posted in Uncategorized on September 25, 2015 by terencemquinn91. 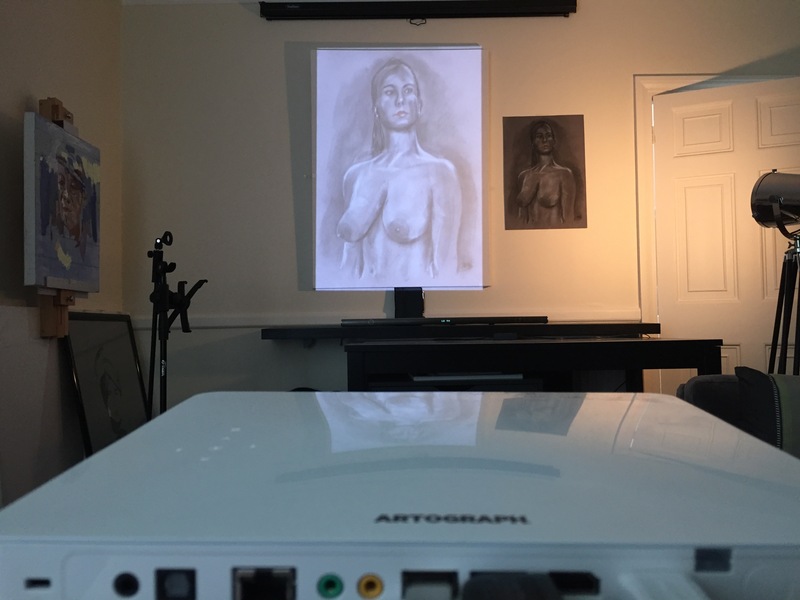 I am really excited (and relieved) that I have been able to arrange this as I was not sure that it would be easy to get a professional life model willing to be scanned as well as drawn. It’s not something they usually do. My plan now is to complete this part of my project before Christmas, and if I can before the end of our first term. My model has sat for me before and her name is Vanessa, a professional life model and dancer in theatre musicals Internationally including London. I am booking two or three sessions at the Cheyne Art Studio in Chelsea. My tutor for this work is Richard Colson, a professional artist and leader of the MA Computational Design course at Ravensbourne, London which is well known and respected as a specialist University (moderated by the University of the Arts London) in all forms of digital media. I will set a pose similar to below and make a full body 3D scan using the Occipital Structure Sensor on my iPad mini and the cloud based scanning service of Itseez3D. I will over two or three sessions produce three or four charcoal drawings, and fast camera photographs through 360 degrees around the model. The scan will allow me to produce another sculpture but from real life instead of from a ready made 3D constructed model (see previous blog). The photos and drawings will also eventually provide the means to produce a digital 3D painting of the life model without her being present. It is not practical for me to draw the model in 3D directly from life in C4D. This is a step too far for me and would take too many life drawing sessions to be a realistic proposition. Besides I have not yet used or made a brush stroke in C4D so it would take forever to do it this way with me as the digital artist! The digital 3D drawing will be in charcoal which can be rotated 360 degrees in Cinema4D (C4D) on my MacBook Pro and projected large on a wall using my Digital Art Projector. This will be the subject of a later blog. This entry was posted in Uncategorized on September 22, 2015 by terencemquinn91. I am grateful to my fellow online students who, following the video presentation on my proposals for my MA, made some useful research suggestions which were also endorsed by Jonathan. These were works by the artists Isaac Cordal and Karin Sanders. I found their exhibits very varied and not all to my taste. Some pieces however were very interesting for putting my work into context with that of other established artists. Isaac Cordal’s work displayed in October 2011 at ENCUENTROS DIGITALES in Madrid was most relevant. See link http://cementeclipses.com/Works/918/. The picture and text below are quoted verbatim from the display. This work alludes to a 3D computer constructed model and could be seen as similar to my idea of projecting a 3D painting in 3D. However, my idea is to paint on an actual computer 3D mesh so that it looks like a conventional (non photo-realistic) life drawing or portrait which can be viewed in 3D in various ways (without 3D glasses) including a holographic display. Thus I aim to confront and use to the maximum the technology that Cordal hoped to avoid or minimise. I want to explore the extent to which digital means can be used to make and present my art, primarily of the life model. Closer to my objective is some of the work of Karin Sanders presented at GALERIE HELGA DE ALVEAR, Madrid in March/April 2000.The pictures below are from the exhibition, and the quotation is verbatim a description from a contemporaneous article by Charles LaBelle (with much of the critical review omitted – he was not very keen) in Issue 51 of Frieze magazine. 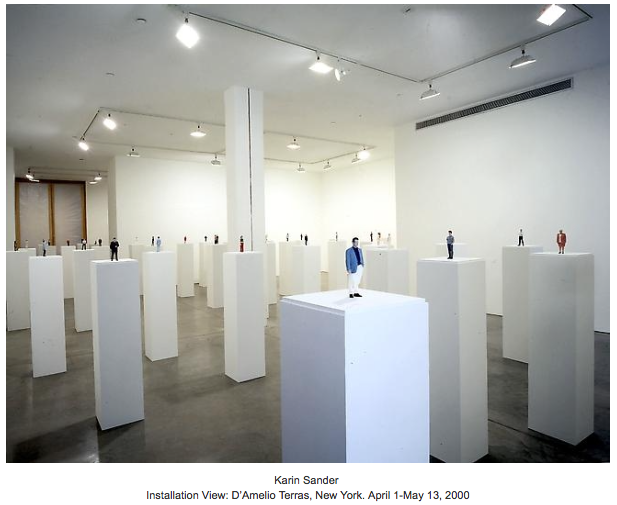 “Sander’s exhibition was titled simply ‘Escala (Scale) 1:10’. Throughout the two rooms of the gallery, Sander presented 50 figures, each rendered realistically in plastic and shrunk to one-tenth their normal size. Frumpy housewives, chunky businessmen, a football player, a ship’s captain, a couple of kids, a bald man and his blind wife, a middle-aged guy in jeans, a diva in a purple gown, a Gen-X girl in bell-bottoms, all stared out from their individual acrylic cases, frozen like inhabitants of a sci-fi force-field. Indeed, the show, at first glance, reminded me of an old Star Trek episode in which an alien race has collected various species from across the galaxy to populate a high-tech zoo. Fabricated out of acryl-nitryl-butadien-styrol by Glats Engineering in Germany through a sophisticated process of 3D body-scanning and ‘fused deposition modelling’, the carefully airbrushed figures are incredibly intricate. Small details, from crow’s feet to shoelaces, are precisely moulded. Only the striated surfaces give any hint of their digital origins. The technology has changed a lot since 2000. Each of Sander’s subjects was subjected to a 10 hour scan in a specially technically constructed space. 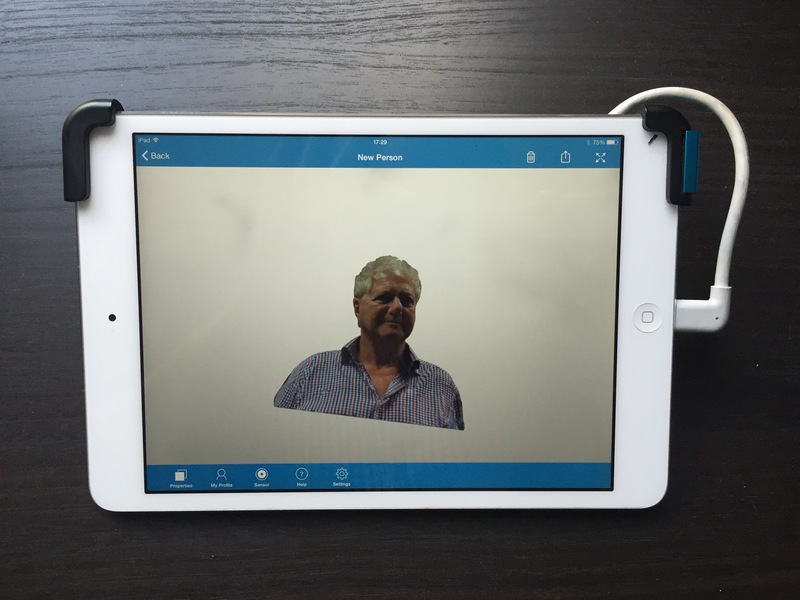 My scanning uses a hand held device and takes minutes anywhere using cloud computing. The construction of each model in plastic was a very expensive process and broadly equates to low cost 3D printing facilities available today. 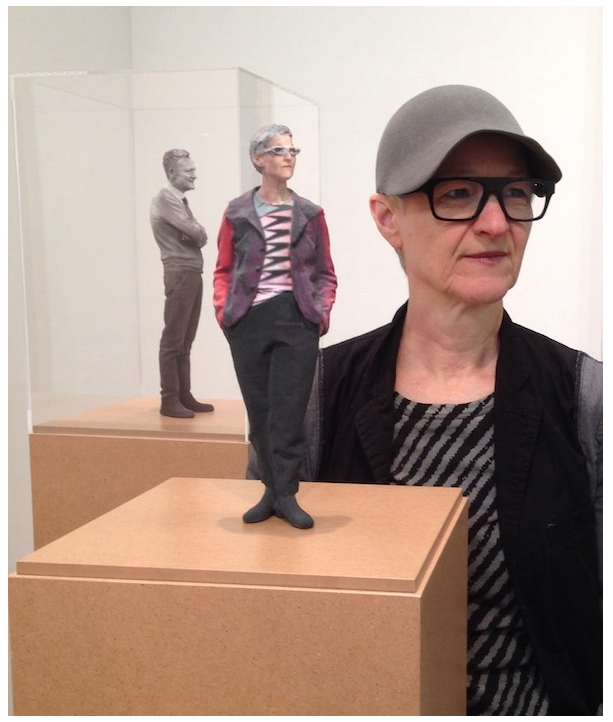 Nevertheless, Sanders is presenting a (clothed) life model in a similar way to my 3D sculpture in sliced MDF. My intended presentation of this work is different to that of Sander’s. It will be part of a collection of differently made and displayed works progressively illustrating how digital technology can extend the artistic representation of the life model beyond traditional life drawing or painting. 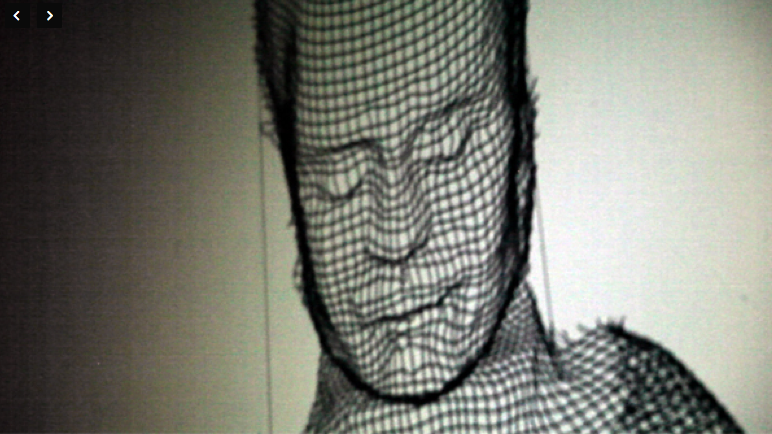 In this example the sculpture will also be painted with light using a technique called ‘projection mapping’. I am not sure that Charles LaBelle would approve! Thanks again to my student colleagues and to Jonathan for stimulating my interests in these artists. This entry was posted in Uncategorized on September 21, 2015 by terencemquinn91. My first steps were to choose the software needed to make the sculpture and then to try it out. 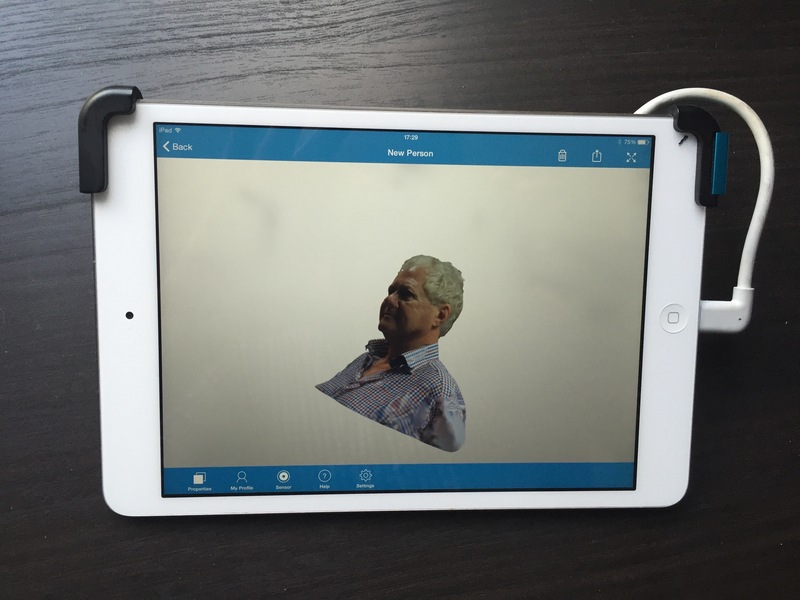 I have experimented with the Structure Sensor (similar to a Microsoft Kinect but attachable to an iPad) with their 3D scanning software but found the latter did not have the quality output I had hoped for when used on a full body scan. This was because their scanning software ran on the iPad which is not sufficiently powerful. So I looked around on the internet for alternative cloud based services (which use much more powerful computers) that I could use with the Structure Sensor on my iPad mini. I experimented with Itseez3D and this produced better results. This service is also free (possibly only for the time being). I also recently attended a two day one to one training session at XChange Training in London. My instructor Matthew O’Neill was very knowledgable on 3D software in general and Cinema4D (C4D) in particular. I showed him my work with the Structure Sensor and Itseez3D (the ‘Colin Blackmore’ head and shoulders model in my video). We discussed the software options for painting in 3D (not a 2D snapshot of the 3D model) and this limited the options considerably. I chose Cinema4D (C4D) for reasons I will explain later in another blog on 3D painting. He advised strongly not to try and learn to rig and animate a model as even an expert would take a dedicated week or more to produce 5 seconds of animation. This led to a discussion on ready made rigged models which I could pose using DAZ3D, POSER, and Turbosquid (more on this later in a future blog on 3D animation). I chose DAZ3D and POSER for ready made models for the 3D sculpture. We discussed using C4D for making the sliced model to be input to a laser cutter. After showing me how this could be done in C4D I suggested that dedicated rather than generalised multi purpose software would be much easier to use. We looked at my suggestion of Autodesk 123D MAKE and he agreed. This week I acquired a free download of DAZ3D and found that it had some limited posing capability. I also obtained a free download of Autodesk 123D MAKE. These were the versions for my MacBook Pro. I decided that I would first experiment with a ready made model. Incorporating the scanning process on a life model in a studio is a step too far at this stage. This is what I managed to produce after about an hour. I was pretty pleased with what I achieved but there is a lot to learn to do this properly. I have also yet to try POSER to see what this software offers to see whether I can get a more refined result. I am meeting Matthew Edwards, one of our Digital Technicians next Friday. I hope to discover where I can use a laser cutter and the format required for the input file needed to cut 47 sheets of MDF!!! This entry was posted in Uncategorized on September 20, 2015 by terencemquinn91. It has been quite an exhilarating week. I attended the welcome event for the studio based fine art digital students and we all spent a lot of time chatting afterwards getting to know each other. I have also ‘met’ all my fellow online MA students twice now, and presented my recent work and study proposals (see my last video blog). Everyone is so open, easy to get along with and keen and Jonathan Kearney is I must say an impressive course leader and a very approachable individual. I could not have hoped for more and I feel very upbeat about my studies at UAL and Camberwell. I must admit to having been a trifle apprehensive about presenting my study proposals as I was not sure how they would be received by my colleagues and particularly Jonathan. I need not have worried. Everyone was engaging and making helpful suggestions and good comments. It was great to see other student’s work and study proposals too. They have quite a varied background and impressive plans. I can’t wait to see the remaining online students’ proposals next week. It’s a pity we cannot see the studio based students’ study proposals too. At the first lecture yesterday on practice based research, I struck up a conversation afterwards with two Fine Art Digital studio based students and found that we have some interests in common that we agreed we would like to pursue together. It is a huge benefit to meet people with similar artistic passions and to be able to share our knowledge and research between us. Yesterday I also had a chance to speak to Jonathan about his immediate reactions to my study proposals – “Terry you have about 5 MA’s there”. We both realise that I have quite an ambitious programme in mind and I now recognise that l will not be able to pursue all of them to the required depth. As I begin to research them all I can absolutely see his point. Nevertheless I was encouraged by his comment that I can save some of them for a future time and any work I do on projects discarded for my MA can be resumed after, so my research on these will not be wasted, and a period of experimentation is desirable in its own right anyway. His advice to now focus on one of my study areas and to prioritise my research and making to this is well taken. So I will begin with making a 3D sculpture of the life model and painting this with light (projection mapping) as illustrated in my study proposal video. In my next blog I will talk about how I am going to do this and hopefully where I can use appropriate facilities and technical support within the University to make the sculpture. On 3 October I am attending an introductory online seminar given by Alex May (who has presented his original work on Projection Mapping at the V&A) and I will talk about this too in a follow up blog. Jonathan is interested in making contact with him too and hopefully we will have a full day on Projection Mapping during our Low Residency next term. Later I will also post blogs on the research that I have done so far on 3D scanning, 3D Painting, Holographic (Peppers Ghost) Projection, and Viewer Interaction with hand gesture using Leap Motion. I am due to have a discussion next week with Matthew Edwards, one of our Digital Media Specialist Technicians who has offered to get involved where he can in these areas and point me to others where he can’t. I will follow this up next term if I have finished the piece I am now focusing on. Finally, as I am about to start my formal research at the University I intend to read one of the books recommended in our first lecture. I am not sure which yet but it will also give me a chance to get to grips with library services. This entry was posted in Uncategorized on September 17, 2015 by terencemquinn91.